The recently constructed political capital of Australia, Canberra has a cultural side much prized by art lovers. Mountains, bush hills and vineyards ring its urban landscape. Explore Canberra with a booking in one of the city’s Novotel hotels where we will offer you the best possible welcome. Art and history lovers will find Canberra the ideal destination thanks to its many museums. During your stay, do not miss the magnificent collections of the National Gallery of Australia, after which you can discover all there is to know about the Australian identity in the National Museum of Australia. End with the Questacon, the science and technology museum. You will obviously want to see Parliament House, the political hub of the country, and the Australian War Memorial. For shopping, take advantage of your stay in the capital to visit the authentic markets of the Old Bus Depot and the bustling Lonsdale Street. You can admire the country’s best sportsmen and sportswomen in the Australian Sports Institute, discover the national arboretum and enjoy a stroll along Lake Burley Griffin on foot or by bike. Do you want a taste of nature? From Canberra, take the path to the summit of Mount Ainslie to enjoy a view of the most emblematic monuments of the city. Thanks to its ideal geographical location between Sydney and Melbourne and its wealth of cultural heritage, Canberra will charm all visitors. 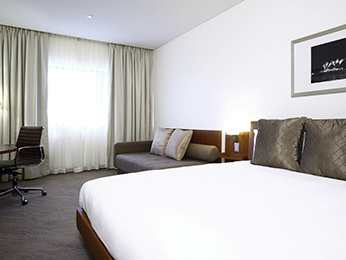 Our Novotel hotel in Canberra will welcome you in a warm, modern setting for a restful and pleasant stay.